Kobe Bryant is currently missing the entire NBA season thanks to an injury. His teammates, unfortunately, still have to play games. They just won their first contest in nine tries to improve in the standings, and now sit at 14-41. That's terrible, and is even five games behind the SACRAMENTO KINGS, of all teams. Bryant went on Jimmy Kimmel Live to talk about all things basketball, and he was shown a clip of his teammates celebrating after said victory, an overtime thriller against the Celtics. Granted, the two teams are rivals, but they're also both just awful this year. So was this an overreaction? 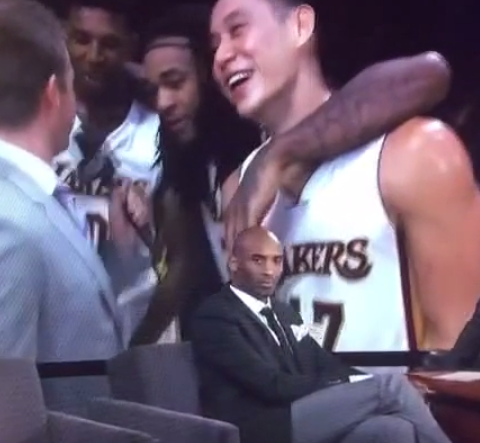 We'll let Kobe's face answer.